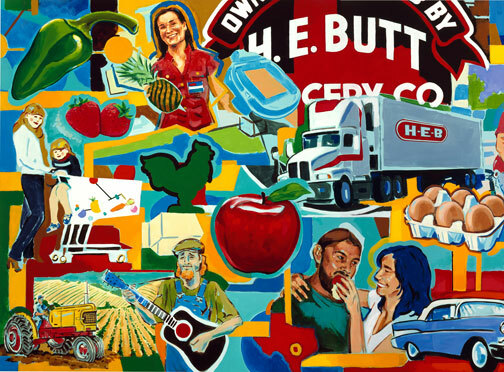 After the success of the first mural painted for them, HEB’s art director Kenny Duggin contacted Rory in May of 2011. They decided they wanted another mural on one of their stores that was being redecorated. Kenny was interested in one of Rory’s fine art paintings, The Narrative, as a point of inspiration. 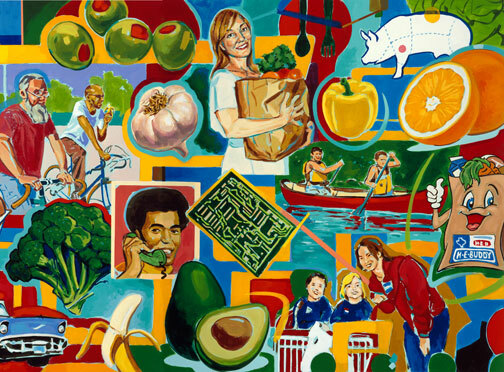 In this case, to be more economical, Rory painted a 4′ x 10′ painting that was then photographed and printed out to be 33′ long. It was mounted between their doors at their location on Congress Ave. in Austin, TX. This entry was posted on Friday, July 8th, 2011 at 1:55 pm. It is filed under Business, Exterior, Retail. You can follow any responses to this entry through the RSS 2.0 feed.